Early on Easter morning, sixteen P-38 Lightings led by John Mitchell leave the ground of Guadalcanal's Fighter Squadron Two on a mission to intercept Admiral Yamamoto's aircraft over Bougainville in the Solomon's. After over two hours flying 420 miles, most of the time at low altitude and open water, the sixteen P-38s reach Bougainville. Like finding a needle in a haystackthere's the flight of two Mitsubishi Betty bombers escorted by six Mitsubishi A6M2Zeros. Lt. Doug Canning broke radio silence with "Bogies at eleven O'clock high". 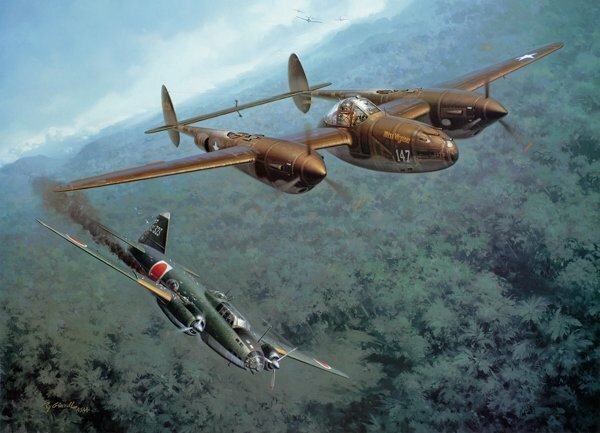 The P-38s go on the attack and during a pref encounter, Barber finds himself about 50 yards behind one of the Bombers and opens fire. The bomber loses its stabilizerand shutters somewhat. Then a long burst gets hits to the right engine and along thewing root, then into the left engine. With it's right engine smoking badly, the Betty snaps to the left and go's down in the jungle as depicted in the Lithograph above. As luck would have it, 1st Lt. Rex T. Barber downs the bomber carrying the Architect of the Pearl Harbor attack Admiral Yamamoto, his fourth victory. After this action Barber assists in downing the other Bomber and destroys a Zero which along with several Zeros took off from Kahili airstrip to intercept the attacking P-38s. With thedowning of the zero Barber becomes an Ace. Pilot signatures include 1st Lt. Rex T. Barber, along with seven other P-38 pilots who were on the Yamamoto mission, John W. Mitchell, who led the attack, Besby Holmes, Doug Canning, Lou Kittel, Roger Ames, Jack Jacobson and Del Goerke, .